The last IBM Connections 6.0 CR4 introduced the new feature "Sharing Files via Link". A quite handy way to share files with users by link. Just open the file, go to sharing and select "Share by Link". "Share by Link" makes it easy to share and grant read access to personal and Community files. So you don’t know if, who or how many users have downloaded your shared file. 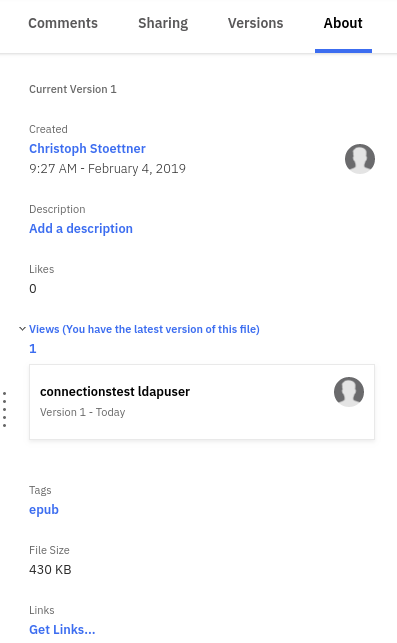 On the screenshot you see my testldap user, I tested with this one too, but he has the admin role of all applications, so he can see the file directly in the viewer and he appears in the Viewer list. A user with default access right does not see the Docs Viewer, they only have the option to download the file. In my eyes that’s nothing I want to have active in my environments. To deactive this feature, go to Gatekeeper (you need to have the admin role in the application Common) and change FILES_ENABLE_FILE_SHARE_WITH_LINK to FALSE. No reboot needed, after a refresh the option for sharing with link has disappeared. Shared file links generate a "Page Not Found" error message after disabling the feature. If you reenable it, old sharing links are working again. Changes with Gatekeeper can be tested on the fly. So no reboots or restarts needed. Just try it. The original post was from 25th of february, but I need to update some things. Today I checked the functionality again and I think there is only a tiny bit missing to have a working solution, which hopefully can be delivered with an update. There are differences in the sharing by link, when you share a personal and a community file. It is important if the file can be opened by the IBM Docs Viewer! 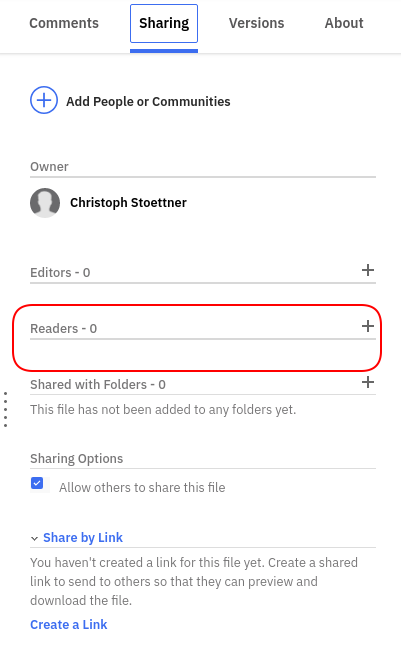 A personal file shared by link which can’t be viewed in the Docs Viewer, can be downloaded by everybody who has the link and the downloading user is not visible in the "Views" Secion of the file. A personal file which can be opened in the Docs Viewer will create an entry in the "Views" Section! For community files it is important if the file is viewable in the Docs Viewer and if the user already can access the file (public communities, or users which already are members in the community). I haven’t checked the dependencies with the Docs Viewer in that case. So users which get access to the file through the link (not member, not public shared) are not appearing in the "Views". User with editor access in community can only share files by link which they uploaded to the community. Files from owners or other members can’t be shared! Owners are able to share any file of a community by link. I’m still not completely happy with the implementation, but I will activate it, when the users can see all downloads and views.